The Domínguez–Escalante expedition was a Spanish journey of exploration conducted in 1776 by two Franciscan priests, Atanasio Domínguez and Silvestre Vélez de Escalante, to find an overland route from Santa Fe, New Mexico to their Roman Catholic mission in Monterey, on the coast of northern California. Domínguez, Vélez de Escalante, and Bernardo de Miera y Pacheco, acting as the expedition's cartographer, traveled with ten men from Santa Fe through many unexplored portions of the American West, including present-day western Colorado, Utah, and northern Arizona. Along part of the journey, they were aided by three indigenous guides of the Timpanogos tribe ( Ute people). Fray Francisco Atanasio Domínguez was born in Mexico City about 1740, and in 1757, at the age of 17, joined the Franciscan order. In October 1772, Domínguez was at the Convent of Veracruz as Commissary of the Third Order. He arrived in Santa Fe on March 22, 1776, in present-day New Mexico, of the Mexican province to inspect the Custody of the Conversion of St. Paul and investigate opening an overland route from Santa Fe to Monterey, California. Upon his return to Santa Fe and Mexico City, Domínguez submitted to his Franciscan superiors a report that was highly critical of the administration of the New Mexico missions. His views caused him to fall out of favor with the Franciscans in power, leading him to an assignment to an obscure post at a Sonoran Desert mission in the Sonora y Sinaloa Province in northern Mexico. Fray Francisco Silvestre Vélez de Escalante was born in Treceño, Cantabria, Spain about 1750. When he was 17 he became a Franciscan in the Convento Grande in Mexico City. In 1774 he came to present-day New Mexico in the Mexican province; he was first stationed at Laguna pueblo and then in January 1775 assigned as a minister to the Zuni. In June 1776 he was summoned by Domínguez for the expedition to California and remained in New Mexico for two years following the expedition. He died at the age of 30 in April 1780 in Parral, Mexico, during his return journey to Mexico City for medical treatment. Vélez de Escalante was known for his journal, in which he described the expeditions he went on. These Spanish colonists were the first European men to travel through much of the Colorado Plateau into Utah, and back through Arizona to New Mexico. During the course of their trip, they documented the route and provided detailed information about the "lush, mountainous land filled with game and timber, strange ruins of stone cities and villages, and rivers showing signs of precious metals." From Dulce, they entered present-day Colorado through Arboles, Ignacio, Durango and Hesperus. 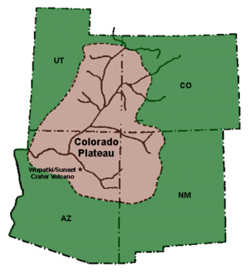 They camped at the base of the La Plata Mountains near the current Mesa Verde National Park in southwestern Colorado.